How much did it cost when you started the revolution of rap singing in India? Dil Dhadke is the first Indian music video that won MTV US award in the international arena. I was paid 20,000/- for my work. The making of video cost Rs 45,000/- which includes the remuneration of hot girl Pooja Bedi. Two more songs (Manjula and Thanda Thanda Pani) won MTV US award. My first album was Dilruba (1990) and second was Ali Baba (1991). But my third album Thanda Thanda Pani became a rage across the country. With the popularity I gained with this album, I could sell my first two albums at a faster rate. You were not seen on Indian music scene post 2000. Reason? I moved to the USA and was giving many stage shows. Stage shows were my bread and butter as there was lot of money in it. You are more known as rapper. What are your other interests? I am into TV shows big time. I am anchoring a top show called 'Santa Banta Newz Unlimited' besides doing a reality shown for Zee TV. Why did you choose a Telugu album as a comeback vehicle? I did more than 22 albums and sung in many Hindi films. But none of the Hindi film songs gave me that recognition I got for my Roop Tera Mastana (Rikshavodu) and Rukkumini (Roja) songs. I find that the people in Telugu are more creative and more patient. The Hindi pop album scene has become like a factory where they spend less time on conceptualization. I got lots of offers in Telugu after I have done Roop Teja mastana song, but could not do it as I was away in the USA and Europe for stage shows. I missed films of Chiranjeevi, Rajnikanth and Kamal Hassan films during that time. I think that it was a mistake not to encash on the success at that time. I want to make it up now by doing a straight Telugu album. What can we expect from this Telugu album? There will be eight songs. All lyrics will be penned by Sobha Reddy. There will be a breeze of freshness in it and I make sure that a lot of thinking will go into this entertaining product. It is going to be a challenging task to learn Telugu and do a rap album in Telugu. But I am sure that I will succeed it with the help of producer Raju Harwani. 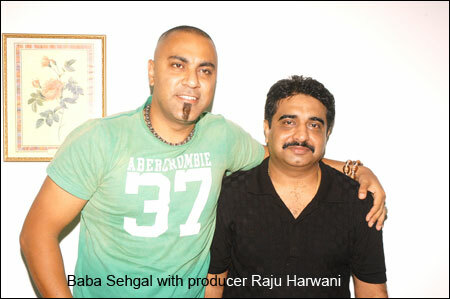 How different is Raju Harwani? Raju Harwani has time and patience to sit with me and involve in music discussions. Since he is a music label owner, he knows how to extract appealing tunes. I feel very fortunate working with him. When will that album release? I am expecting it to hit the stores by September 2007. There is going to be a sizzling video to promote these songs in a big way. Are you open to sing in Telugu films as well? Yes. I already accepted a couple of songs now. I want to act in villain roles in Telugu films. I am sure that I would prove myself if given the right character. I am a great fan and follower of Kishore Kumar. But my image of rapper is overshadowing my ability to sing melodious songs. I can sing melodies better than most of the contemporary singers. Among the black singers, I like Will Smith the most. He is an all-rounder. What is your opinion on Himesh Reshammiya? I hold a tremendous respect for him. He delivered 28 hits in the last year and 20 hits this year. His film as hero 'Aap Ka Surroor' too is a commercial hit. He is a phenomenon in Hindi film industry. He charges the maximum (around 40 lakhs per appearance) for a stage show. What is your take on girls dressing scantly and gyrating pelvis to sell music albums? I am not against using women to sell albums. But women should be shown sensuously without being vulgar. All these gyrating moments by girls are vanishing overnight after becoming extremely popular after one remix songs. Where are Meghana Naidu, Rakhi Sawant and Shefali Zariwala (Kanta laga fame) now? Unfortunately these girls get more remuneration than the singers who rendered their voice. What is your opinion on singing talent contests? All these contests are being held for increasing TRP ratings of the TV channels. But I doubt how my they are helping the young aspiring singers to find a career after the contest is over. What is your impression about south film industry? I am very much impressed with Rajnikant. He does lot of charity and he never tells anything about it to the media. I am awed by the hype created by Sivaji film nationwide. I think Sivaji film made the North India to sit up and take notice of South Indian film industry. I love his styles and his charisma on screen. My son is one of the innumerous north Indians who watched Sivaji for Rajnikant. Probably Rajesh Khanna is the only star who has such stardom like Rajnikant in the entire India since the birth of Indian film industry. For 2-3 years Rajesh Khanna ruled the roost as superstar where lots of women renamed their husbands as Rajesh. I sung in a film titled Lonawala Khandala Ghat which is due for the release. I have couple more songs in Telugu apart from this album. I am seriously considering a career in Telugu. Please wish me the best.